By John Motoviloff: Late fall and early winter mean hunting season in the Midwest and Northeast. 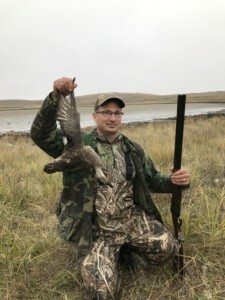 Deer, turkey, small game, and waterfowl are all in play, giving hunters a wide range of options to pursue in the field and enjoy on the table. On those red-letter days when a deer, turkey or goose is bagged, there’s no doubt as to what’s for dinner. 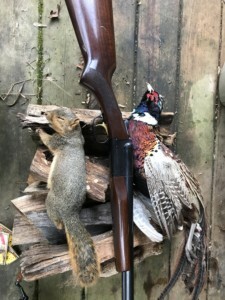 But on those more frequent occasions when the hunter’s bag is slimmer or mixed—say a few squirrel and a pheasant or grouse and rabbit—there’s still plenty of good eating to be had. The cook just needs to change his or her mindset. The trick is to think of stretching what is there rather than presenting one centerpiece. The dish becomes as much about the starch and other local ingredients as it does the game itself. It’s no secret that Cajuns (who live on the edge of rice country near the Gulf Coast) have become experts at combining the odd duck, squirrel, or rabbit with some spicy sausage and a handful of crawfish to make gumbo or jambalaya. Similarly, Spaniards are world-renown for mixing game like rabbit and quail with rice to make an inland version of paella. While rice is nice—in southern climates and warm weather—game stews reach their full potential when chunks of meat are swimming in a thick, rich sauce. From tangy bigos and paprikás of the East to the brown mushrooms sauces of France and Germany to the tomato-and-olive-heavy cacciatores and stifados of the Mediterranean, every corner of Europe has its own version. 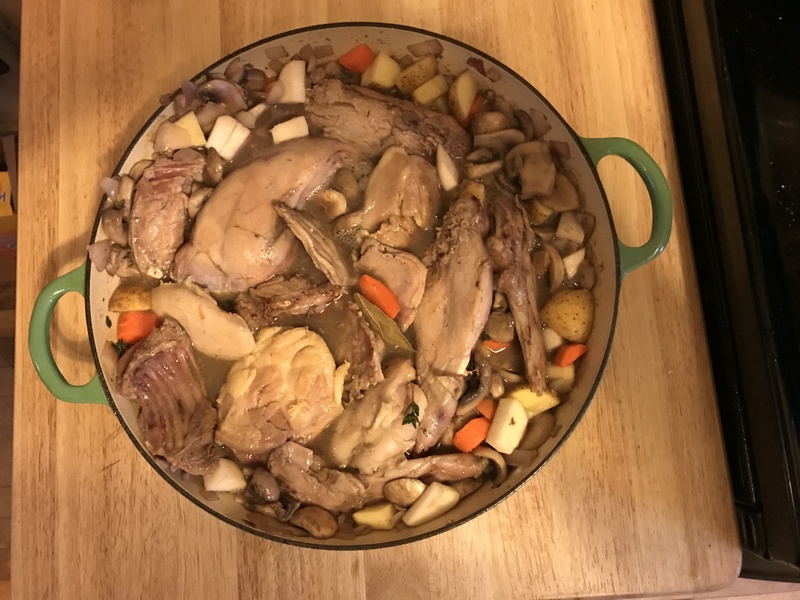 Gamebirds, small game, and venison—alone or in combination, with domestic meats or without—are all at home in these preparations. Because I have a knack for cobbling things together, I often find myself the appointed chef when the bag is mixed—a role that I enjoy playing. As I simmer the broth at my cabin in the woods of southwest Wisconsin, I think of how many pioneer families have done the same, at once drinking in the rich smell and thinking about the leanness of winter to come. I strip meat from the bones and watch as fall on the river valley below. I’m also waiting for my hunting pals to come back to the cabin. Next step is browning onions, peppers, and carrots and dusting them with flour to make a roux. I throw a log of hickory into the woodstove, careful not keep the flour from burning. The dog, tired from the day afield, thumps her tail on the couch. 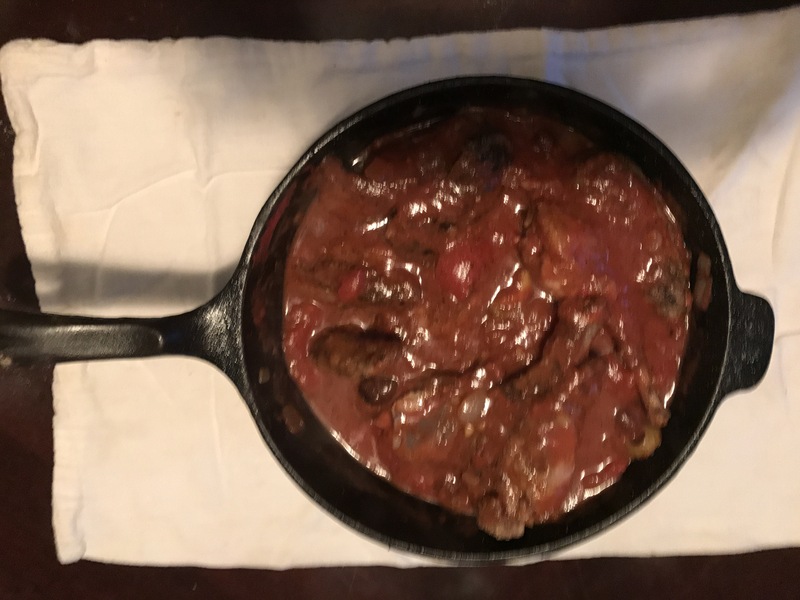 I pour in the strained broth and the stew becomes a roiling golden liquid, which turns a mellow orange once tomatoes are added. I replace the meats as I put cornbread in the oven to bake. As the smells reach their crescendo, my hunting pals arrive. Soon, we are crowded around the crude table, ladling dollops of stew onto chunks of cornbread. It’s dark outside. We can hear geese and cranes settling into the far marsh across the river for their night roost. We unroll our sleeping bags and get ready for the following morning. At the end of the day, it’s stew that takes the sting out and binds us all together. Simmer, gamebird, squirrel or rabbit, and venison in 2 quarts salted water until tender; remove meat and allow to cool. Strip the meat from the bones. Cube venison if necessary. Keep broth on low heat. In a Dutch oven or similar pot, heat bacon grease and brown the chopped onion, pepper and carrot until onions start to brown around the edges, stirring occasionally. Turn heat to low; introduce the flour to the pot and stir to coat the vegetables. Pour the hot reserved meat broth through a sieve over vegetables. Stir until flour dissolves. Add tomatoes, potatoes and corn. Cook until potatoes and carrots are fork-tender. Add seasonings. Add the prepared meat into the pot and cook an additional half hour over medium heat. Serve over fresh cornbread or in bowls with French bread on the side.